Making a few personalised 60th birthday cards with my Mum. It's pretty great giving handmade cards to someone who appreciates them so much she wants to do the same for others. Eating Mum’s homemade tuna mornay. It was an exchange; we’ll make the cards Mum's after and she’ll provide dinner. Packing for a weekend camping. Weather looks…cold but dry, until Sunday. Watching scrapbooking process videos. I’m a little obsessed at the moment and the last couple nights have even snuggled down in bed with a video from Ali Edward’s Hello Story class playing on the iPad. Considering signing up to a trial of Big Picture Classes. If I’m after process videos, seems like a good source. Reading The Ceramics Bible: The Complete Guide to Materials and Techniques by Louisa Taylor. Waiting to pick up my new pots. I arrived home feeling stressed on Friday after finishing my last class, having rushed to complete all my glazing which takes a lot longer than you’d expect. Hope they all turn out! Contemplating a new business idea. Thinking, mulling it over. How does Pottswood Studio sound? Laughing at a Facebook post from my sister-in-law: Things you feel you shouldn’t have to say to a toddler; ‘Stop drawing on your brother’s head with a texta’. Spruiking a sale on Simple Scrapper – 20% of 6 month memberships, available till the end of the month. Disliking arriving home from work in the dark. We’re only days away from June; how did that happen? Anticipating our holiday in warmer climes. Having dinner at an Italian restaurant last weekend, we started our dinner with a share plate of delicious cheeses. (Well, two delicious and one I thought tasted of dirty socks.) Cheese + Italy = Awesomeness. Procrastinating completing any of the planning required for said holiday. Yet again. Planning definitely not my favourite. Thanking my parents for their encouragement and support. They’re pretty awesome too. Wishing my sister Jenna and her dude Darren good buying as they attempt to navigate the property market for the first time. Feeling inspired with ideas for lots of projects I like to work on. Wondering where the time goes. Thankful it's the weekend, but seriously where did the week (month!) go? Blogging from my phone. That explains any weird formatting. Last Sunday Mike and I enjoyed fairy bread, sausage rolls and cake when we celebrated the first birthday of this little sweetie, the son of good friends of mine. First birthday parties have the best food! Couple of days earlier I was asked to take a few photos of the event, just 10 or so Liz said. I laughed, because I don't think I've ever picked up my camera and taken only 10 photos. After an evening of sorting through photos, deleting, selecting and editing, I've got a renewed respect for event photographers. Thankfully my friends had low expectations; it's the first thing I checked! Leonardo da Vinci's Mona Lisa is one of the most famous paintings in the world. Maybe the most famous. Yet many of her visitors, thousands upon thousands each year, leave feeling underwhelmed. Personally, I've spent more time watching the crowd than looking at the painting itself. Mona Lisa is smaller than expected, 0.77 metres by 0.53 metres, and although a beautiful and enigmatic painting, it's not really artistic merit that has her so famous. In 1911 Mona Lisa was stolen off the wall of the Louvre. Three Italian handymen, employed to build glass cases for some of the museum's prized works, hid in a storeroom overnight and removed the painting Monday morning while the Louvre was closed. It wasn't until the next day the theft was discovered, but when the museum released a statement it made headline news around the world. Crowds gathered at police headquarters, wanted posters appeared on Parisian walls, the French border was closed and all departing ships and trains were searched. When the museum reopened a week later Franz Kafka was along the thousands of people who queued to view the empty spot on the wall. Conspiracy theories abounded; Pablo Picasso was among those bought in for questioning. By the time Mona Lisa was discovered two years later, when one of the thieves attempted to sell her to an Italian art dealer, she was the most famous painting in the world. I think Mona Lisa's history, including vandalism attempts, hanging in the bathroom of the king and the unanswered question of why da Vinci kept this painting with him, makes her all the more interesting. The estimated value of $770 million doesn't hurt either. She's worthy of a visit the next time you're in Paris. After not having visited Healesville Sanctuary in years, Mike and I were back again for the second time in a month. The draw card, spending time with our cutie niece and nephew. I received a text message the night before from my sister-in-law, who'd told my niece 'we are going to see Mike and Lanie tomorrow and some of the animals we would see and she got all excited and said "that's perfect".' Love her! My favourite part, snuggling with Mr Cutie as we wandered the Animals of the Night exhibit. Mike's favourite part, visiting with a wombat up close in a Pat and Play session. The ranger was a little horrified when the wombat took a nip at my nephew's foot, but all toes were accounted for. No tears, no harm. I think he got his own back though. (Ranger approved, couldn't stop laughing in fact.) Ride'm cowboy! Tonight I hit send on the comments to our photographer reviewing our wedding album draft. It's only taken six months! Eric had the draft ready for us even before we returned from honeymoon, but I don't think I was ready to look through the photos. Not like that - critical and analysing, choosing this photo in favour of that. I love our wedding photos. I'm pretty sure I'll love our wedding album. I just love my memories more. When I saw the June sketch templates from Simple Scrapper's membership collection, I knew I wanted to play with patterned paper to create an oversized title. With one small monochromatic photo, the title adds energy and interest, with the distressing and crumpling supporting the layout theme. The squeal of brakes, the crunch of metal, the crash of glass. I’ll be happy to never hear that sound again. May 1, 2015. The day my 14 (or so) years of accident-free driving came to an end with a right turn on Nicholson Street. I paused at the intersection, looked before beginning my turn. I saw the delivery van coming straight at me and put my foot down to try and get out of the way but there was nothing that I could do. He hit, shoving the car sideways. My glasses tumbled off, landing in the passenger seat. I’d stopped and looked, hadn’t seen anything. There was a work truck waiting to turn right the opposite direction, maybe I remember a tram a little down the street as well. They must have screened the van from view. As we exchanged details the other driver commented that we were both at fault, which makes me think there was some speed and lane changing going on as well. As Dad said later, it was an understandable accident. I needed to hear that. We both walked away; it could have been so much worse. No ambulance, no police, just a wonderful lady who gently talked me through the exchanging of details. And a tow truck. Poor Stormy. $550 for the insurance excess, a massage appointment for sore muscles. Stormy has some dings but that is what insurance is for. It might have been so much worse. Although it's not a favourite topic - I'm voting for at least 14 plus years before any more car crashes thank you very much - but I'm loving how this layout turned out. 7:47am // After hitting the snooze button a time or two, breakfast of jam on toast and a cup of coffee. 8:23am // With Stormy being a little dinged, I'm driving Charles, Mike's Landrover. Parking is not my favourite, or forte for that matter. 8:29am // Reflected. The car could probably do with a wash.
8:38am // Waiting; for the train, for stormagedon they're predicting on the news, for Friday. 9:10am // Train commutes go quicker with a book. Proven fact. 9:53am // Settling into work with a precious second coffee of the day. 12:08pm // Today's lucky dip from the freezer. Generally I love leftovers; four minutes in the microwave and lunch sorted. While chatting with Mike, discover taking screenshot while on a call ends the call. Oops. 3:09pm // At work, delivering work. 6:25pm // Climbing with Ben. It's the third week straight I've climbed but I'm still sucking. Slowly, slowly. 7:49pm // Post-climbing dumplings and jasmine tea. 9:36pm // Watching Nashville on Netflix and adding a few finishing touches to my Simple Scrapper layout. 11:04pm // Organising a quick blog post about the Mothers' Day cards Mike made. I think he'll get a laugh out of it. 11:48pm // Day is done, past time to for bed. Alone, as Mike has afternoon shift tonight. That was my Tuesday May 12th, 2015. Inspired by Ali, I recorded some snapshots of my day. Do you participate in Day in the Life? On Saturday night (because there's nothing like leaving things to the last minute) we sat up at my scrapbooking table and Mike made Mothers' Day cards. 3: one for his Mum and each of his grandmothers. There was much laughing and mess made. I offered a suggestion or two but he did all the creating. Apparently alphabet stamps don't come with enough letters, I should own a Mothers' Day stamp and scrapbooking is kind of fun. And we both agree, everything's better with pop-dots. Finally, my December Daily 2014 is complete! December 23 - Organising Mike's Christmas present and wrapping. Lots of wrapping. Nothing like leaving things to the last minute! December 24 - Carols by Candlelight, a Christmas favourite of mine. The red Santas (which looks messy in that photo) are a super old flocked transparency that I added to the pocket, with a file tab. December 25 - Christmas Day; morning with my family, evening with Mike's. It was both calm and chaotic, but an always wonderful day. I created a see through pocket with pieces of ribbon (from presents) glued to a clear transparency, with a joke from a cracker added on top. There are gift cards throughout the spread, including those I've hole punched straight into the middle of the spread. The back of one of those cards provided my space for journaling. December 28 - Christmas celebrations with my Dad's side of the family, including my beautiful looking ham. December 27 - After a month of photo-taking, or really two months given our honeymoon, I decided to do something different and bring my Instax camera to the birthday celebration. I juggled the date order a little for allow for the two 6x4 pockets. December 29 - Boxing Day Sales shopping with my Mum. December 30 - A day getting messy in my garden. I added my journaling to the photo before printing. December 31 - A quiet New Years Eve at home with my husband. (Still odd saying that!) The polaroid style photos were created with the Collect app. With a page size of 6x8 already determined, I kept the title page fairly simple but strong to balance out the elements from the next page that would show through. Honestly, I don't think this is my favourite December Daily album I've made. This was my 5th year so there is a few that can fight for that. But I love the stories and the details that I've recorded. It takes me forever and I'm so pleased to finally be finished, but I love this project. So pleased to have done December Daily, every time. You can find all my previous December Daily posts, pages and albums here. Inspired by the Simple Scrapper story starter theme for May, Leisure Time, I decided to add some pages to my Appreciating Winter mini album. Started a few years ago, this mini album is a collection of things I like about winter, just waiting for me to add a page or two whenever the mood strikes. For my second Simple Scrapper layout of the month I decided to create another wedding day layout, Using a sketch from the membership collection, I selected softer colours for this layout about our wonderfully surreal afternoon tea. Journaling reads: Surreal, in a good way, is how Julie described it. Sitting in the middle of the bush (it felt like), greeted by kangaroos on the way in, drinking tea from fine china and dressed in all our wedding finery - surreal it definitely was, but wonderful. Chatting, laughing, taking a moment together. So glad this crazy scheme of mine worked, and was worth it. Starting later this month, Simple Scrapper is running a free event that might be of interest. 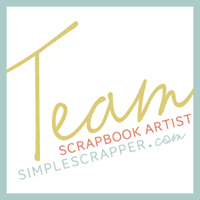 Together with the free sketch and template set that is available on the blog each month, it's a great opportunity to sample what Simple Scrapper has to offer! The best way to experience our community for yourself is at the upcoming Photo Crush event. During this 7-day challenge, Jennifer Wilson will help you streamline your photo library so that memory keeping is even easier.